The Alpha NEX-5R Digital Camera from Sony is Sony's latest compact interchangeable lens "mirrorless" camera. If you're considering an upgrade to a DSLR, but not sure you want to carry around such a big camera (or the big expense) or you're presently shooting with a DSLR and want comparable image quality in a more compact form, consider the Sony NEX-5R. For starters, the 16MP APS-C-size sensor, fast Hybrid Autofocus, burst shooting up to 10 frames per second and on-camera operational dials offer you a few of the quality and design elements of a DSLR. Of course, you also have the capability to use a variety of lenses, the hallmark of DSLR photography. However, the NEX-5R brings with it advantages that DSLR's cannot offer, starting with its compact body which is about half the size of a DSLR. Add to that built-in Wi-Fi and a tilt-able LCD screen with touch screen operation (including shutter release!) and you begin to realize that the NEX-5R is a special camera that can offer you the best of both worlds. 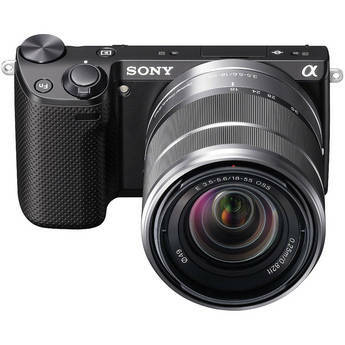 The 16.1MP APS-C-size Exmor HD CMOS image sensor housed in the NEX-5R is the same sensor format that Sony puts into its DSLR cameras and provides stunning, high-resolution images that can be blown-up for gorgeous prints with fine details and silky textures. It also is a highly sensitive sensor that can handle low-light situations. Sony's BIONZ Image Processing Engine suppresses color and luminance noise, giving you enhanced color reproduction, rich tonal graduations and an amazing clarity of detail. It also provides fast performance and processing speeds.